Want to be notified of new releases in Miraikomachi/MiraikomachiUnity? Copyright (c) BANDAI NAMCO Studios Inc. This Character Guideline is a guideline for the use of Mirai Komachi illustrations, 3D models, and characters. Article 1 (License) We authorize individuals or their circles to use secondary creations based on the illustrations of the Mirai Komachi for non-commercial purposes only. The original Mirai Komachi illustrations and logos can be used for non-commercial purposes only when posting videos to video sites. In addition, the following shall be prohibited. ・ Use that infringes or threatens to infringe upon the rights of third party. 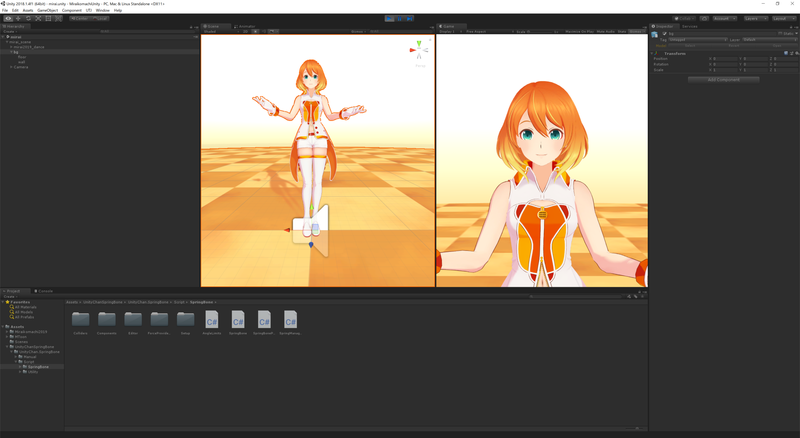 Note that some of the assets included in the Unity projects in Mirai Komachi are provided under an open source license. Please refer to the attached license for use within the project. Contact us for other uses. We may change the contents of this license from time to time at our discretion. If this English version of the Character Guideline conflict to the Japanese version, the Japanese version shall prevail.